This is an account of a cycle tour we did along the St. Lawerence river in Québec in early August, 2010 with our friends Deirdre and Bob. Most of the tour was on the north side of the river, through the Mauricie, Québec, Charelvoix, and Manicouagan regions, but we also rode on the south side in the Montérégie and Centre-du-Québec regions at the beginning, and in the Bas-Saint-Laurent region at the end. 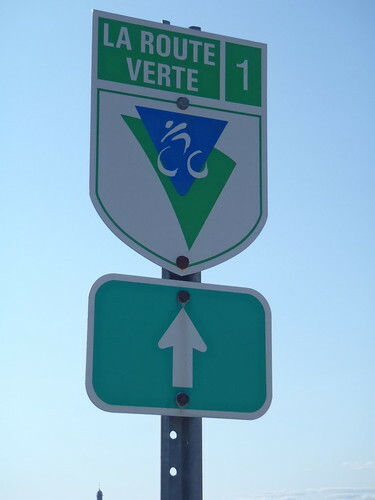 We followed many sections of the Route Verte when it went where we wanted to go, but in other areas like the Charlevoix, we picked our own route, and used whatever local vélo-friendly facilities we found. We travelled on fairly lightly loaded road touring bikes (the same bikes that we use to ride BC Randonneurs brevets in British Columbia - Susan and I on the Marinoni touring bikes that we started randonneuring on, and Deidre and Bob on their Gunnar Sports). We stayed in gîtes and auberges that we had pre-booked - the Bienvenue cyclistes! certification for accommodations is a great idea. We generally ate breakfast at our accommodation, had snacks at cafés, boulangeries, and casse-crôutes along the way, bought food for picnic lunchs at boulangeries, fromangeries, and depanneurs as opportunities allowed, and had dinner in restaurants, or at our accommodations. We ate really well! This is a work in progress, with sections being added as time and motivation permit. The page footer shows that date of the last update. Our Flickr photo set from the tour is also a work in progress - we're gradually adding titles, descriptions, and locations, and editing out the redundant and poor images. This turned out to be the day of the tour that we rode the longest distance, even though it had been planned to be among the shortest. The original plan was to take the train from Montréal to Drummondville and ride the 40 or so kilometers along the Route Verte from there to our 1st night's gîte. But only 1 train a day on that line takes bikes, and it doesn't leave Montréal until evening. So, we had no choice but to ride - oh, darn! Up at 07:00 for a breakfast of lattés and croissants. On the road at 08:20 with Michael and Kieran riding with us to the ferry. Down the hill from Westmount to the Lachine Canal bike trail which was in heavy use by all kinds of cyclists. 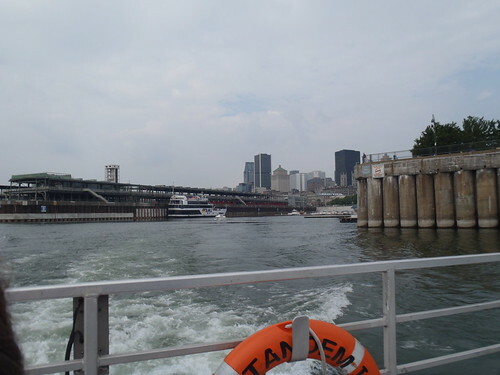 Arrived that the old Port of Montréal ferry dock with lots of time to spare so we went on a tour around Old Montréal before we said goodbye to Michael and Kieran as the ferry pulled away. The ferry stopped at one of the Expo 67 islands before dropping us off on the south shore of the St. Lawerence at Longueuil. From the ferry dock we followed the Route Verte along a mixture of paved sidepaths, Hwy 132, and Route Marie-Victorin to Varennes. Then we followed a back roads route that Deirdre had worked through Calixa-Lavallée to the Richelieu River at Saint-Antoine-sur-Richelieu. While we were on Route Marie-Victorin we chatted with a guy who was cycling out to meet his brother. He questioned each of us about our bikes, our trip, and our route, and wanted to make sure that we were riding through the "beautiful village of Calixa-Lavallée". At about 60 km we stopped for lunch of baguette, the dry sausages we bought at the Jean-Talon market in Montréal on Sunday, and ice cream beside the river at a little store and snack bar in Saint-Antoine-sur-Richelieu. After lunch Bob discouvered that he had a puncture on his front wheel, so we had an excuse to relax a while longer in the shade of the big trees along the river. 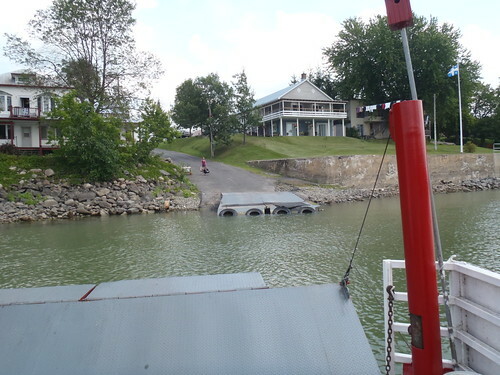 We continued north along the Richelieu river to Saint-Roch-de-Richelieu where we crossed the river on a cable ferry to Saint-Ours, and rode along more quiet, flat back roads through farm lands with stops in a couple of villages for Gatorade and ice cream. The quiet roads ran out and we had to ride a busy, shoulderless section of Hwy 132 with agressive, unfriendly traffic to get across the Yamaska and Francoise rivers. But then it was back on to a quiet, riverside farm road to take us to Gîte Espace Temps where we arrived just as a heavy downpour of rain started. Wow, did we start the trip off on a high note for accommodation. André and Sophie were wonderful, welcoming hosts. André helped us get the bike stored out of the pouring rain in the barn, and our bags inside, then showed us to the 2nd floor of the heritage farmhouse. There are 4 rooms, but we were the only guests. The bathroom is shared and has a huge shower all finished in beautiful stone tile. There are big, fluffy robes, and the house is decorated with lots of wood, sculptures, and stained glass. After showers we relaxed in the upstairs common room while we waited for the already good smelling dinner that Sophie said would be ready at 18:30. André and Sophie offer a table d’hôte dinner with an amazing selection of locally-sourced meat, fowl and game, and we had chosen pheasant. But before the pheasant came a salad from their garden topped with a piece of wild turkey terrine. For the main course we were each served with a half a pheasant wrapped in pancetta, a huge portion of potatoes au gratin, and a stir fry of garden vegetables. Sophie was very concerned that we get enough calories and a balanced diet to help us ride all day tomorrow. When we asked for wine André produced a selection from their cellar and we chose an Italian Merlot. Dessert was a pineapple cake made of cream and ice cream with a strawberry sauce, wash down with good coffee. Tired after a good day's ride, well fed, and perhaps still a little jet-lagged, we were asleep by shortly after 21:30. We heard rain a few times in the night through the open window, but slept well in the quiet of the countryside. Up at 07:40 for breakfast at 08:00. Fresh squeezed juice (carrot, I think), coffee, fruit, homemade yogurt, soft boiled eggs (in egg cups! ), cheddar cheese, and granola. Deidre and Bob had tartines reveille-matin, big thick slices of homemade bread with sliced apples, cinnamon, and cheddar cheese, grilled in the oven. André rolled our bikes out of the barn for us, and we loaded up and were on the road at about 09:20. The roads were still wet from the overnight rains, and the sky was cloudy. We cruised along more quiet farm roads with a descents and climbs through river valleys. We ignored a route barré sign and ended up riding, then walking through wet, clay-rich soil in a road construction site in La-Visitation-de-Yamaska, and then had to spend a lot of time beside a river using sticks to dig clay out of our cleats, pedals, and mudguards. We stopped for 11:00 lattés in a café in Nicolet just as the rain started. By the time we were ready to ride again the heaviest shower had passed, and we rode in slight rail along a Route Verte rail trail, and then back on the road through more construction to get to the south end of the Pont Laviolette that spans the St Lawerence between Bécancour and Trois-Rivières. Lunch of baguette, dry sausage, cheese curds, Tomme de Haut Richelieu goat cheese, and ice cream at Fromagerie L'Ancêtre before we went to the nearby Tourist Office to hook up with the shuttle across the Pont Laviolette. The shuttle turned out to be a mini-van with a receiver hitch bike rack on the back operated by the towing company across the road from the Tourist Office. We were dubious at first, but the rack was really high quality, and the driver was really careful about loading the bikes. Deirdre's went in the back of the van - along with (at the driver's insistance) everything that could conceivable come off the bikes - and the other three went on the rack. Though it offended our "ride anywhere" sensibilities to be forced to use a shuttle to cross the bridge, it was sadly obvious that riding across would be really unpleasant: 2 narrow lanes of high speed traffic with no shoulder, no sidwalk, and a long steep climb up the high level bridge. Even so, the $10 per bike charge for the shuttle trip seems pretty steep. From the shuttle drop-off point in a part at the north end of the Pont Laviolette in Trois-Rivières we had to do some searching to find the Route Verte but finally ended up on a mixture of streets and bike paths through parks that would through the city and to the bridges that cross the Saint-Maurice river via Île Saint-Christophe. We had a rain shower that became quite heavy for a few minutes as we rolled out of the city on the Chemin du Roy. Generated on: 2010-09-03. Generated by Docutils from reStructuredText source.